So writes Scott Heganbart in an article for Food Product Design. I have recently had a startling glimpse into the full significance of this deceptively simple statement. Ever since my discovery of The Cake Bible by Rose Levy Beranbaum, I have been intrigued by this thing called ‘cake flour’. Until then, I had always assumed that flour was divided between plain (or all purpose) and self-raising, with a more macho variety of plain for breadmaking. But here was someone who had devoted a huge amount of time and energy ensuring that bakers in the UK could achieve the same results as those in the US using only the ingredients that were available to them … which didn’t include cake flour. What then is cake flour? Beranbaum gives a detailed description of this ingredient in a section entitled ‘Understanding Butter Cakes’. From this, I learned that cake flour is low in protein because it is milled from soft winter wheat. It is also less acidic and able to absorb more water than other flours because it has a finer granulation and is bleached by chlorination. Apparently, the whole success of Beranbaum’s recipes for butter cakes relies on the structural advantages made possible by these properties of cake flour. At first, I filed these differences away as a quirky curiosity and launched into following the UK-specific recipes. However, it soon became apparent to me that whilst tasting delicious, the butter cakes I was producing were not matching their descriptions. And then, one day, there was the disaster of the Golden Luxury Butter Cake. A velvety grain?? More like a soggy, dense lump of play-dough. Even the ducks were disdainful as they watched it sinking to the bottom of the pond. What was going wrong? I decided to take a second look at this question of flour. Back in 1992 when the UK edition of The Cake Bible was first published, self-raising flour in the UK was bleached. It was this bleaching process that allowed Beranbaum to create her solution of mixing plain and self-raising flour in recipes for butter cakes. Now, here comes the important part … I discovered that self-raising flour in the UK is no longer bleached. In fact, the Flour Advisory Bureau states that the process was not permitted after 1997. In other words, the work-arounds developed by Beranbaum have had the carpet swept from under their feet! Sherlock Holmes taught, once you eliminate the impossible, whatever remains, no matter how improbable, must be the truth. Well, the only remaining course of action seemed to be to create my own alternative form of cake flour using processes and products available in the UK! I really wasn’t expecting to find any success along this route. After all, I have a flawed and very incomplete awareness of cake theory, little understanding of biochemistry or molecular science, and a kitchen full of children and their paintings rather than scientists and their laboratory equipment. Foolishly undaunted, I set out nevertheless to discover my own cake flour. I needed something finely milled and low in protein. I found this in the Italian 00 grade flour that is widely available in UK supermarkets. At 9.9g of protein per 100g of flour, Doves Farm Organic speciality pasta flour was the most suitable that I could find (contrary to its claim to be high in protein, this flour is not only more finely milled but also has a lower protein content per 100g than all other brands of plain flour that I could find on the supermarket shelves). It seemed too good to be true. Would this work in my own kitchen? Apparently, best results were obtained using flour with a protein content between 4% and 9%. My pasta flour was slightly above this at nearly 10%. Also, it appeared to be very important to use undehydrated flour so it has sufficient moisture to be able to interact with the microwave field and so reduce the moisture content to less than about 6%. My pasta flour? I really didn’t have a clue about its moisture content or whether it was already dehydrated or not. I could only cross my fingers! Taking an enormous leap of faith, I set to work in the kitchen. 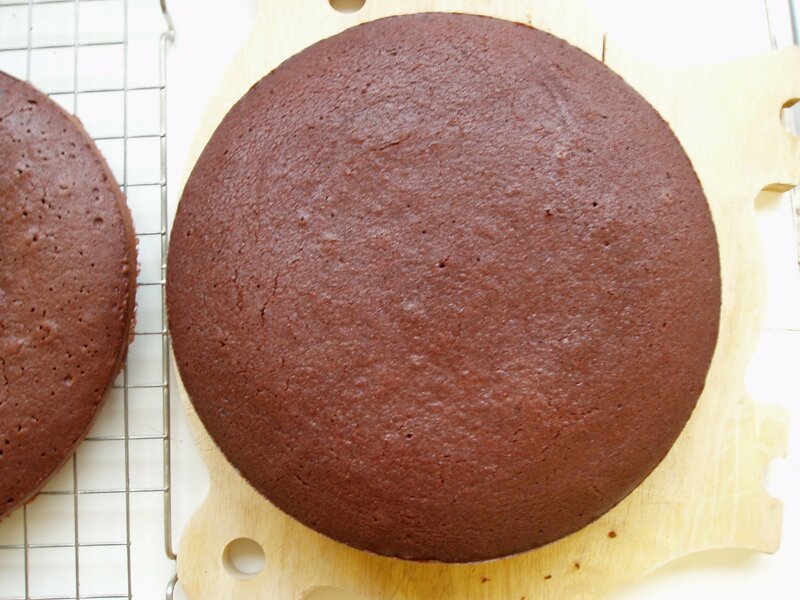 I decided to bake two versions of Beranbaum’s Perfect All-American Chocolate Butter Cake. In the first, I followed the original US recipe and replaced the cake flour with my own microwaved flour. 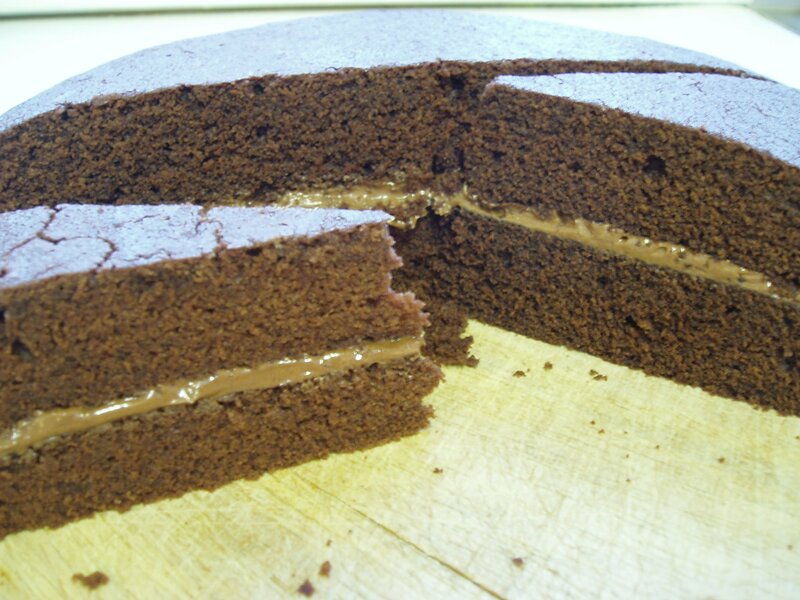 In the second, I followed the UK recipe and used McDougall’s Supreme Sponge flour. This is a self-raising flour milled specifically from soft wheats. The packaging claims that it can absorb more moisture and sugar than standard flour and will produce a very light, soft texture. To make my own cake flour for the first version, I carefully weighed out 235g of pasta flour. I spread this on a plate to give a bed depth of 2cms and blasted it on high in the microwave for 1.5 minutes (half of my total alloted time of 3 mins). When I opened the door, a great amount of steam escaped from the microwave and the flour had started to clump together. I fluffed it up a bit with a fork and put it back in for its second blast. It then occurred to me that, with all this moisture evaporating, the finished flour might not weigh 235g anymore … so in my best scientific practice, I quickly spooned on a couple of extra tablespoons of flour and blasted this mix for the remaining 1.5 minutes! I now had a reserve of ‘cake flour’ that I could weigh out and sieve. Despite having carefully researched and concocted my own version of cake flour, I had remarkably little faith that I could produce anything remotely edible with it. 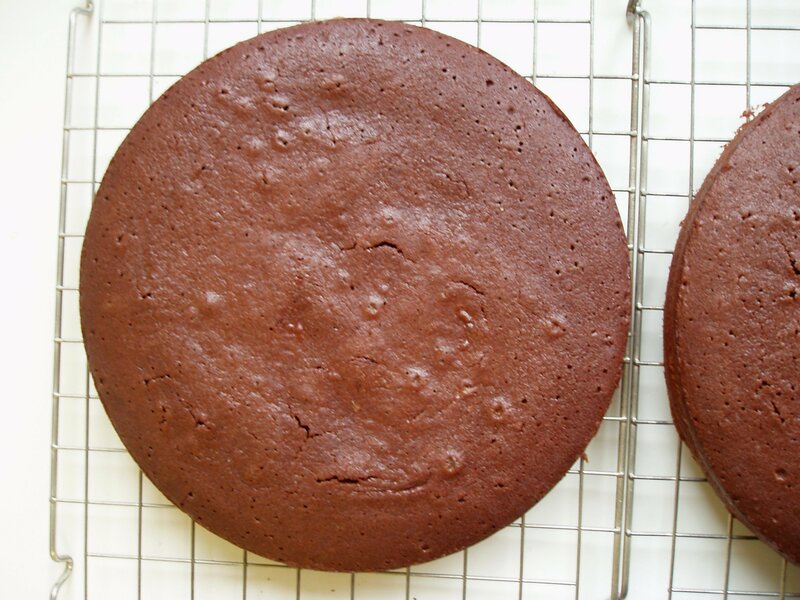 I certainly wasn’t anticipating the startling effect that my flour had made when the two cakes were out of the oven. The cake layers (on the left and centre) made with the UK self-raising flour were good illustrations of what had happened so far every time I tried a butter cake recipe from The Cake Bible. They were bubbled on the top and dense inside. The cake layers made with my microwaved flour (cooled and stacked on the right) were beautiful! Smooth tops with a wonderfully light, fine texture inside. I was so excited! Not only did my microwaved flour have a dramatic effect on appearance, but it also had a comparable effect on the taste of the cake. The UK/self-raising flour version was quite delicious but also heavily moist and buttery. The US/microwaved flour version was quite another story – light, chocolatey, soft and exceptionally exquisite. I can’t provide tasting samples online, but the difference is clear in this photo. The UK/self-raising flour cake is on the left in the foreground; the US/microwaved flour cake is behind. The next day, the UK/self-raising flour cake seemed to have a buttery strip running through the centre of each layer whilst the US/microwaved flour version had retained its lightness. If anything, the US/microwaved flour cake had become even more meltingly chocolatey. I can only say, “Mmmmmmm” as I now have something to think further about … and some delicious chocolate cake to eat as well! This was utterly fascinating; kudos to Tag Surfer for bringing it to me. 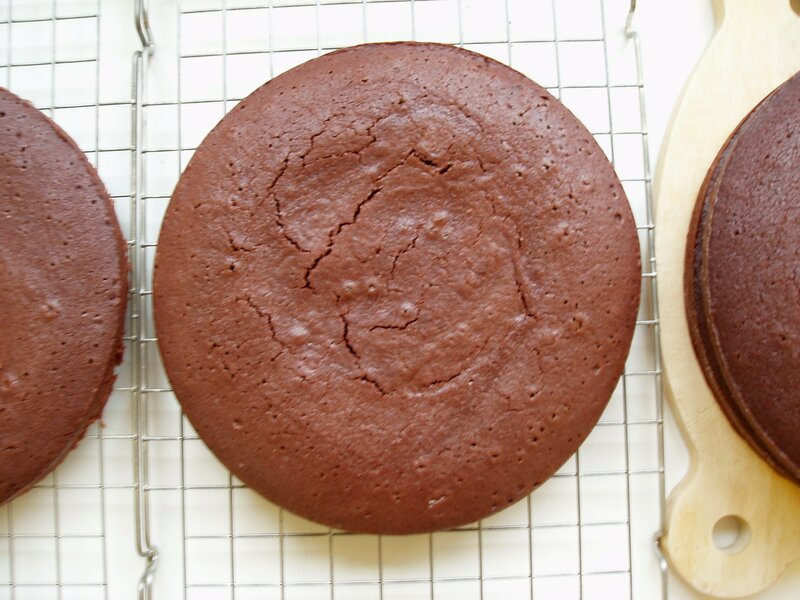 Your microwaved-flour cakes look the way mine do with cake flour. I’ve bookmarked your excellent post. Thanks! I’m so pleased the microwaved-flour cake looks like yours with cake flour. I was wondering, as I haven’t got the ‘ultimate’ sample to compare it with! Very interested to read this, you certainly have a lot more learning about flours than I have! And patience! I will look out this particular flour now and try your method with the microwave, I’ll get back to you on my results with Rose’s recipes. Thanks for the information. Hello! I’ve come to your blog via RLB’s blog. The cake flour thing drives me crazy here! How clever you are to find something that works. I am dead impressed. I have 2 boxes of illegal cake flour to use yet…smuggled in by my friend Diane. (She couldn’t believe all I wanted was cake flour brought over to me.) But when it is all gone, I will try out your cake flour. Duh on me. I was so riveted by your findings it didn’t occur to me to mention a common substitute for cake flour, as many Americans don’t buy it and keep only one flour on hand. For every 120g (1 cup) of plain all-purpose flour, remove 2 TB and replace it with cornstarch (cornflour). Jeannette, I’m looking forward to hearing how your cakes turn out. My problem now is that I have the UK version of TCB and need the US version to try out the cake flour recipes! ellaella, thanks for your tip about the book by Shirley Corriher. I’ll definitely hunt that one out. Hello Kate, I just finished reading about your flour experiment. WOW! very impresive. I do have a couple of questions if I may? I do live in the US so cake flour is not a problem but I have a 10 pound bag of unbleached flour in my cupboard. I was wondering if you get the same results with the flour and corstarch method as you do with the cake flour? If so can I measure the flour and corstarch instead of weighing them? Maybe 4 cups flour – the 8 tablespoons + the 8 tablespoons cornstarch? The cake flour is more expensive than the regular flour. Thank you for all your time and help. You could measure the flour/cornstarch if you wished, but it’s more precise (and I find it easier) to weigh the ingredients. By the way, it doesn’t really seem to matter whether you microwave the flour before or after adding the cornflour, so you can do whatever you find the simplest (or less messy!). Hello! I’m trying out your bleaching method today. Can I ask, do you use the same amount of baking powder suggested in The Cake Bible? Or do you increase it? I’ve read in a couple of places that the UK baking powder isn’t as strong. After six disasters I succeeded with the cake and will be making the final (wedding) cake! Many thanks for the baking powder advice and many many many thanks for the microwaving the flour technique. The difference is remarkable. Thank you so much for your site! I am an American living in France. In the States, I enjoyed the reputation of creating wonderful cakes. Have not had success in France, and have experimented with every cake troubleshooting idea I could find. I am eager to try your method and see the difference. All results here, to date, have been too dense, and not the light, fluffy cakes of my past successes. I had an inkling it could be the difference in flour, and will write back and let you know of new results. Interesting that cookies and other baked goods turn out well, while cakes do not.